Posted on March 31st, 2018 in At large. The SSE wind was blowing 15-20 kts from before sunrise. It was overcast and out at sea the MHL buoy was seeing 1.7 metres of 9-sec bump from the SSE (160°). Tide was building to a swampy 1.8 m at 0905. And there’s a 40% chance of a shower. Lovely. Outlook broadly speaking is for the energy levels to stay around their current intensity through to Thursday when some of the models are showing a faint uptick from the east along with light winds early. Southeast to northeast winds are expected to affect most of the state’s waters today with a ridge extending to the northern New South Wales coast from a high near New Zealand and an almost stationary trough lying across the coast near Seal Rocks. The trough weakens on Sunday as the ridge becomes more predominant, bringing east to northeasterly winds to much of the coast. A weak southerly change is expected along southern parts of the coast later Sunday, before a stronger southerly change, associated with a cold front moving through Bass Strait, affects southern and central parts of the coast during Monday. Southeasterly 15 to 20 knots turning northeasterly 10 to 15 knots in the evening. Northerly 15 to 20 knots shifting southerly during the evening. Posted on March 30th, 2018 in At large. Posted on March 30th, 2018 in Dee Why. Good Friday sees it very small at Dee Why. It’s a beautiful morning though and there are little waves where the combo south and north swells are synthesizing into knee to waist high bumps. But looking at the cams, it is very crowded wherever there’s anything remotely catchable. Dee Why’s not on the list at the moment, but maybe the 0820 1.83 m tide running out to the 1445 low will see an improvement – before the southerly starts filling in later. The MHL buoy at 0500 was seeing 1.2 m of 10.5 sec swell mainly from 168 degrees, but with some 30 degree component mixing in as well. 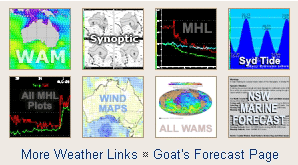 As for the outlook, The Goat posted his weekend and week ahead thoughts last night, so scroll down the page for the skinny. A high pressure system near New Zealand extends a ridge to northeastern New South Wales. This high will remain slow-moving for the next few days, while a series of cold fronts pass to the south. A trough and associated southerly change will move along the the southern half of the coast today, before dissipating over central parts on Saturday as the ridge returns to dominance. Northerly 10 to 15 knots becoming southerly 15 to 20 knots in the evening. South to southeasterly 10 to 15 knots, reaching 20 knots in the morning, turning east to northeasterly in the afternoon. Posted on March 29th, 2018 in Goat's Forecast. A chill out Easter weekend ahead for you :).. Which may be just what you need. Perhaps a little time for reflection too. The change of season always seems to do that to me…remembering and being grateful for the good times and laughs, surfing and otherwise, at this time in years gone past. Nice weather, small waves, warm water..nothing to get the heart pumping too much, but there should be waves for people who enjoy mals and SUPs at the right place, right tide. Daylight saving will end at 3am on Sunday, 1 April 2018, when clocks go back one hour (NSW Government). Sunny. Light winds becoming northeasterly 15 to 20 km/h in the afternoon. Sunny, cloud developing during the afternoon. The chance of fog in the outer west in the early morning. Slight (20%) chance of a late shower. Light winds becoming south to southeasterly 20 to 30 km/h in the early afternoon. Cloudy. Slight (30%) chance of a shower. Winds south to southeasterly 15 to 20 km/h becoming light during the morning. Mostly sunny. Light winds becoming east to northeasterly 15 to 20 km/h during the day then turning south to southeasterly during the afternoon. Partly cloudy. Medium (40%) chance of showers. The chance of a thunderstorm later in the day. Light winds becoming southeasterly 15 to 20 km/h during the day. Partly cloudy. Medium (60%) chance of showers, most likely during the morning. The chance of a thunderstorm. Light winds becoming southeasterly 15 to 20 km/h during the day. Posted on March 29th, 2018 in Dee Why. Just about totally flat everywhere I looked on the 1.8 m morning high tide. A beautiful day for the beach otherwise with light winds, warm water and sunny skies. Out at sea the swell was coming from the east. It was about a metre out there and the period was 7 seconds. So, the beaches were showing wave faces in the knee high range – on the bombs. Have a great day everybody and go well with your plans! The point an hour after a 1.8 m high tide. This is will be a 0.2m low tide in 2100. At high tide the pool will be underwater. There are kids in primary school who will see this when they’re old duffers. A high pressure system near New Zealand extends a ridge to eastern New South Wales. This high will remain slow-moving for the next few days, while a series of cold fronts pass to the south. A trough and associated southerly change is expected to affect the southern half of the coast on Friday, before dissipating over central parts on Saturday. Northeasterly 10 to 15 knots tending northerly in the evening. Easterly to northeasterly 1 to 1.5 metres. Northerly 10 to 15 knots becoming southerly 15 to 20 knots in the late afternoon or evening. Southeasterly 15 to 20 knots turning east to northeasterly 10 to 15 knots during the afternoon. Northeasterly 1 to 1.5 metres, tending easterly around 1 metre during the evening. Posted on March 28th, 2018 in At large. Went down to the beach to see if I could grab a few snaps of some friends playing in the shories near Kiddies. There are little waves (at 0700 the MHL buoy was showing 1.6 metres from the ESE at 11 seconds) but the 1.76 m high tide at 0635 was killing it. Waves were fat and floppy out the back and only showed their power when they finally expired with a crash on the sand. Wind was light and offshore, but as the tide drops and the day goes along, it should settle around to a 10-15 kt NEr. It’s set to be sunny all day as we go to a high of 28°. Water is a balmy 23° and Beachwatch says it’s clean again too. So maybe mid-tide there’ll start to be something of interest at magnets. The trend is for energy levels to hold at about the current intensity today and then to possibly nudge up a little on Thursday and Friday. Have a great Wednesday and keep on smilin’! Posted on March 27th, 2018 in Dee Why. Cloudless skies and a light west wind this morning at daybreak. Feels like autumn. Swell has moved around more to the south overnight and as of 0500 was 1.5 m and coming mainly from 159° (although there was still some small, longer period component out of the NE). The odd nice looking line coming around the point, but no one was on it and I’d guess it was closer to knee than waist high. Up the beach the line looked to be a similar size. At 0500 .The MHL buoy was showing 12-sec period, but it looked a lot closer together than that to me when I grabbed the pics. So, figure on knee with the occasional waist high set. Tide is dropping to a lowish 0.4 m low at 1215. Wind should wander around to the easterly quarters this morning and then settle to the NE this afternoon. Outlook is for swell size to bumble along more or less at the current intensity until Friday when we might see a slight uptick. The swell models were more optimistic about Friday yesterday, but they’re less so today. It will be what it will be of course. Have yourself a top old Tuesday everyone! A southwest to southeasterly flow extends along the New South Wales coast in the wake of a cold front. Winds will begin to turn east to northeasterly by this afternoon as a high pressure system moves over the Tasman Sea and extends a ridge northwest across New South Wales. This high will remain slow-moving for the next few days, before a weak trough moves along the southern coast on Friday. South to southeasterly 10 to 15 knots turning east to northeasterly in the afternoon and becoming northeasterly 15 to 20 knots by evening. Around 1 metre, increasing to 1 to 1.5 metres by evening. Northerly 10 to 15 knots turning northeasterly 15 to 20 knots during the afternoon. Posted on March 26th, 2018 in South Narrabeen. Decided it was too small to go for a surf at Dee Why after seeing it this morning. Unbeknownst to me, the weak swell was focusing at various points along the Narrabeen to South Narrabeen stretch – a fact I discovered when I went for a bike ride around lunchtime (with a wetty and my camera because I felt like taking some pictures of the little shories). Anyway, it turned out to be chest plus on the occasional sets. Before you feel too hard done by, be aware that it was breaking in waist deep water and therefore very challenging to get more than a turn or two off before the inevitable. Great for picture taking though! Posted on March 26th, 2018 in Dee Why. Perfect conditions this morning, but only the barest hint of swell showing at Dee Why. If you waited long enough – and were in exactly the right spot – there were knee to waist high one-wave sets. But in between those widely scattered and infrequent moments, it looked like a lake., And the BoM forecast says it’s only going to get smaller today. Just in case you need ’em, here are some numbers: next tide is a 0.48 m low at 1110, daytime high will be around 27°, swell as of 0600 was 1.4m at 8.7 sec from 156°. Water according to Beachwatch is a balmy 23°. Also, due to 16mm of rain in the last 24 hours, Beachwatch is putting a question mark over a number of beaches at the southern end of the peninsula this morning. The consensus of the models is that we’re faced with 3 more days of marginal to flat conditions and then maybe things will turn around Thursday afternoon-ish as a 11-12 sec NE pulse starts to fill in. If you had to pick a day to skive off this week, I reckon Friday’s the plan. Go well with your Monday everyone! A weak high pressure systems lies over the Tasman Sea as a cold front moves north over the waters extending an associated west to southwest flow over all but the far northeast. In the wake of the cold front, a weak ridge will develop over the south. West to northwesterly 15 to 20 knots tending west to southwesterly 15 to 20 knots in the middle of the day then tending southeast to southwesterly 10 to 15 knots in the late afternoon. Northeasterly 1.5 to 2.5 metres, decreasing to 1 to 1.5 metres around midday. 60% chance of showers early this morning. The chance of a thunderstorm early this morning. Sunny afternoon. South to southwesterly 10 to 15 knots shifting northeasterly 15 to 20 knots during the day.